Excellent, Jeff – I shall be borrowing that for sure. A minor suggestion: now that you have a class “edit_money” on each item you could remove the style=”text-align-right” and put it in CSS shared by the whole app. Thank you for sharing this. I’m confused about a couple of things. Where does this go? And is it necessary? I don’t know think that I have a global.js but I put the $(document)….. snippet in the “Function and Global Variable Declaration” area of the page. I’m not getting any results. We’re on 5.1 now and it looks slightly different than your screenshots. 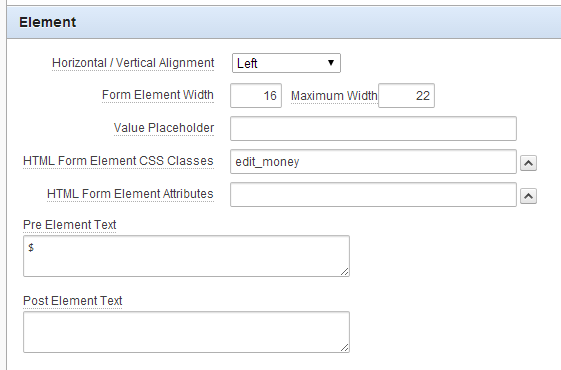 Does the “edit_money” go in the Appearance->CSS Classes or Advanced->CSS Classes? 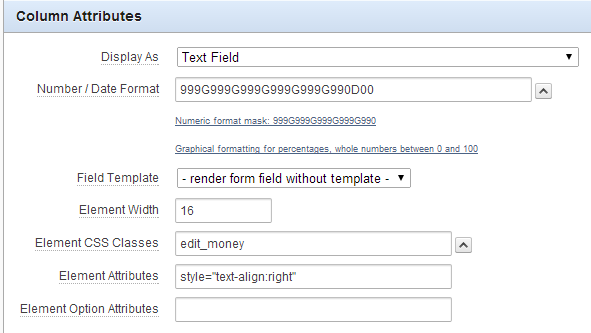 I have a regular page item Text field inside a region, not in a grid. The APEX_ITEM.text construction is only necessary if you’re generating the item using PL/SQL, e.g. in a report. In that case, there is no “CSS Classes” attribute that you can assign; instead, you pass the class in the p_attributes parameter to the function. For page items in Apex 5.0 and later, you put the class in Advanced -> CSS Classes. To me works perfectly when you write the number. But if you calculate the number, the trick doesn’t work. Any way to work if the item is “display only”, for example? Another option for this is accounting.js library. Thanks Nicolas, that looks like a good option to consider.